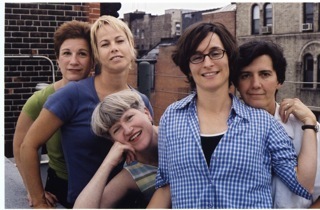 For the past 23 years the Five Lesbian Brothers have created provocative lesbian theater for the masses using the fine feminist art of collaboration. They are Maureen Angelos, Babs Davy, Dominique Dibbell, Peg Healey, and Lisa Kron. They came together as a theater company in 1989 at the Obie- Award-winning WOW Café Theater in New York City’s East Village. Together the Brothers have written five plays, Voyage to Lesbos (1990), Brave Smiles (1992), The Secretaries (1994), Brides of the Moon (1996), and Oedipus at Palm Springs (2006) – as well as numerous event-specific show-stopping acts. The Brothers’ plays have been produced off Broadway and off-off Broadway and beyond by theaters such as New York Theatre Workshop, The Public Theatre, the WOW Cafe Theatre, Downtown Art Company, Performance Space 122, Dixon Place, La Mama, the Kitchen and the Whitney Museum of American Art at Phillip Morris. The Brothers have toured their work to London, Los Angeles, San Francisco, San Diego, Houston, Columbus, Seattle, Philadelphia, Boston and the deep woods of Michigan. Their plays, published by TCG and licensed by Samuel French, have been produced by other companies throughout the United States and, believe it or not, in Zagreb, Croatia. The 2 Brothers have received an Obie, a Bessie, and a Lambda Literary Award, as well as a 2011 Independent Theater Award.for lifetime achievement. Their plays are taught in theater and queer/feminist studies courses in colleges and universities throughout the country.